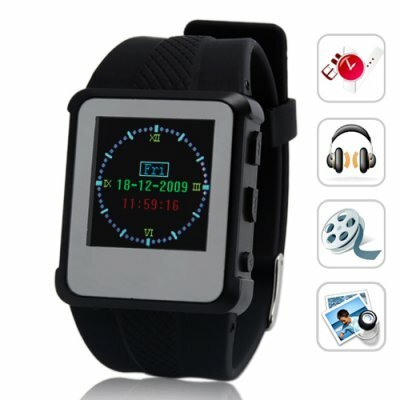 Successfully Added Original Watch MP4 Player 2GB Black - 1.5-inch Screen to your Shopping Cart. The Original MP4 Player Watch as featured on tech news all over the internet - now in its third generation. Digital watch with a 1.5 inch full color video screen and 2GB of flash memory. You can use this beauty to view your favorite videos, listen to MP3 music, look at your favorite digital photos, browse t-text files, or even as a USB style flash drive memory stick. Provided in full retail packaging, with all the necessary accessories included in the box - this a great product that you should to have in your online catalog. From the leader in direct from China wholesale electronics, Chinavasion. This watch has so many fantastic features.Its just great. An MP4 watch?, incredible!!!! on 2007-05-17 04:02:44 New version? I bought a coulpe of these recently (May 07): Very highly recommended. I don't know if they have newer firmware, but they don't have the limitations described in most of these reviews. I've been looking at these things for some time. Other than questionable quality of construction, the OLED screen alone makes it worth the price. The most likely reason for the enormous size of the video files produced by the software is that the video is actually being uncompressed. MP4 is just a container, not a codec. The software is probably using MP4 format to contain a raw YUV or RGB stream - these are essentially a series of sequential bitmaps with no compression at all. The calculations required to decode compressed (i.e. DivX, XviD) audio/video streams would require a lot more processing and therefore dramatically reduce battery life. In other words, it was a choice between fitting in 100+ hours of video that you couldn't watch more than half an hour of on a single charge, or fitting in 2 hours of video that you could watch all of on a single charge. All in all,its a fantastic watch & I'm glad I got one!